Uttarakhand, carved out of Uttar Pradesh (in November 2000) with a total area of 53,483 sq. km., of which 86% is mountainous and 70% forest covered area, has a total population of 10,116,752 as per 2011 census and 10.32 million (estimated) as of 2017. The State is rich in natural resources like mountains, glaciers, dense forests, and rivers with topographic diversity, pristine natural beauty and religious shrines, which provide opportunity to the tourists for adventure, leisure, ecotourism and religious tourism. The state has potential for adventure tourism opportunities like trekking, skiing, paragliding, camping, fishing, mountaineering and rock climbing. Tourism played a major driver of livelihood promotion of inhabitants of Uttarakhand. Table 1 and Fig. 1 reveal that the number of domestic tourists visited Uttarakhand has been increasing consistently from 11.08 million in 2008 to 29.75 million during 2016 except the years, 2001, and 2013 to 2015. 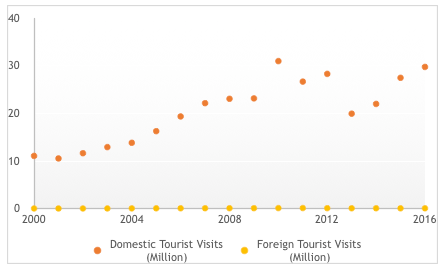 The number of foreign tourists visited Uttarakhand has been increasing consistently from 0.057 million in 2008 to 0.143 million during 2011 and after 2011 it started declining except the years, 2014. 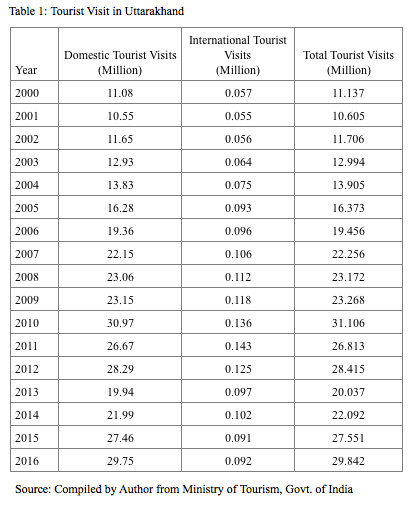 However, the total number of tourists that visited Uttarakhand has been increasing consistently from 11.137 million in 2008 to 29.842 million during 2016 except the years, 2001, 2011 and 2013, when it declined by 4.78%, 13.8% and 29.48% respectively. During 2013, the decline in tourist visit to the state is largest during last 13 years due to devastating cloudburst and landslide. Uttarakhand has huge potential to attract not only national but also international tourists because of its geographical location, natural beauty, biodiversity, forests, rivers, mountains and glaciers. Adventure and watersports is one of the important form of tourism in Uttarakhand. The famous places for adventure and watersports are Rishikesh, Auli, Shri Hemkund Sahib, Jharipani, Maldevta, Tons Valley, Dhanaulti, and Tehri. Uttarakhand is famous for pilgrimage and festivals. The places of attraction for pilgrimage and festival tourism are Gangontri, Yamunotri, Kedarnath, Badrinath, Rishikesh, Haridwar, Jageshwar, Baijnath, Piran Kaliyar, Hemkund Sahib, and Nanda Devi. So far as geographical location is concerned, Uttarakhand is mostly famous for nature and wildlife tourism. The places famous for nature and wildlife tourism are Jim Corbett National Park, Rajaji National Park, Binsar Wildlife Sanctuary, Kedarnath Musk Deer Sanctuary, Nanda Devi National Park, Askot Musk Deer Sanctuary, Neel Dhara Pakshi Vihar, Benog Wildlife Sanctuary, and Govind Wildlife Sanctuary. Sightseeing in Uttarakhand plays an important aspect of tourism. Some of the important sightseeing places of Uttarakhand are Mussourie, Nainital, Valley of Flowers, Almora, Kausani, and Auli. So far as nature based medicinal products are concerned the state attracts tourists for health and rejuvenation. The places which attract tourists for health and rejuvenation are Rishikesh, Haridwar, Champawat, Pithoragarh, Ramgarh, Jageshwar, Almora, and Nainital. Rural Tourism form an important aspect of tourism in the state. The famous places for rural tourism in Uttarakhand are Mana, Chokhta, Chakrata, Deora, Pallyu, Shaukiyathal,Bageshwar, Chamoli, Almora and Tehri. Thus, if the kind of tourism mentioned above will be promoted, planned and executed sustainably then the state not only attract significant number of tourists but also will generate huge amount of revenue. Natural disaster is one of the challenge to face in Uttarakhand. Natural disaster is uncertain and unpredictable. The most important example of disaster in Uttarakhand is Kedarnath and Badrinath tragedy during 2013. Uttarakhand observed several landslide disasters since 1978 viz. landslides in Kanoliya Gaad of Uttarkashi in 1978; in Mansoona village of Chamoli in 1998; in Pithoragarh district in 1998; in Budha Kedar area of Tehri district in 2002; in Varunvat of Uttarkashi in 2003; in Uttarkashi, Pithoragarh, Chamoli, and Rudraprayag in 2010; and in Ukkimath area of Rudraprayag in 2012. Uttarakhand has witnessed many cloudbursts since 1978 viz. cloudburst at Gayansu village in 1980; at Uttarkashi, Pithoragarh, Chamoli, and Rudraprayag in 2010; at Assiganga and Bhagirathi valley of Uttarakashi in 2012; and in Badrinath and Kedarnath area in 2013. Similarly, since 1978, Uttarakhand has seen two earthquakes viz. earthquake in Uttarakashi district in 1991; and in Chamoli, Uttarakashi and Tehri in 1999. Around 86% of land in Uttarakhand are mountainous and there are numerous instances where development is on disaster prone high risk zones. Therefore, due to disaster prone areas, many times natural and manmade disaster happened. Infrastructure development in and around Hill areas are very poorly planned. Unplanned and unsustainable tourism activities coupled with poor solid waste management at tourist places are largely damaging the forest ecosystems and biodiversity of the State. Many times due to very poor road and communication many accidents occurred. Places like Mussourie, Nainital etc. are no exception to it. Managing tourists during Char Dham Yatra coupled with parking and traffic management at major Hill stations are major challenge for the State. Availability of potable drinking water and agro-processed foods at all destinations make the tourism business more cumbersome. Due to poor road connectivity, construction of public convenience is a major issue, which make availability of clean and adequate public convenience facility as another challenge. Inadequate and poor quality accommodation along with inadequate rail and air connectivity make tourists less attractive to visit the places. Poor regulation and safety standards for development of niche tourism products like adventure tourism, health and rejuvenation is also a major challenge for the state. With these challenges in hand there is a need for sustainable tourism business in Uttarakhand state. The success of sustainable tourism business rests upon many policy targets to meet, the major targets among them are to make Uttarakhand a world class tourist destination; to minimize the risks, involve with various challenges in tourism business; to preserve the Himalayan ecosystems and biodiversity while continuing tourism business; to generate sufficient employment opportunities for inhabitants of Uttarakhand with sustainable tourism business. There are ample opportunities for tourism business so far as the geographical features, land scape, forests, ecosystems, biodiversity, river, mountain and glacier of Uttarakhand are concerned. However, these opportunities are not free from risk. These risk are also manmade and natural. While manmade risk can be eliminated by 100%, we can minimize the natural risk to some extent. Thus in front of us there are many policy targets, the major targets among them are to make Uttarakhand a world class tourist destination, to minimize the risks involved with various challenges in tourism business, to preserve the ecosystems and biodiversity, and to generate sufficient employment opportunities for inhabitants of Uttarakhand with sustainable tourism business. In order to meet these policy targets there is a need for academic and policy research with support from policy think tanks and public authorities to prepare a framework and formulate holistic and integrated approach for sustainable tourism development and tourism business.